Jaisalmer Tourist attractions places to Visit. Every city has some story to tell. The old walls have witnessed the secrets for centuries. Once you place your ears close to these walls, worn down by time, you will be able to listen to these amazing tales. The first thing that you require is an open mind and the second quality is the thirst to know new places. It is true that the books and the internet will be able to give you detailed knowledge about the place. But the charms of breathing in the rustic air, basking in the sun, feeling the warmth of the local people cannot be got from the books. For enjoying these aspects, you need to visit the place in the flesh. 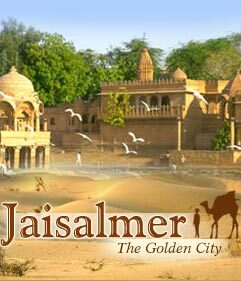 The same holds true for all tourists who are considering a trip to the royal city of Jaisalmer. There is much about the city that will impress tourists. The natural beauty is just an icing on the top of the cake. The aspects, which draw the attention of international tourists, are the forts and the stories of Rajput valor. The mysticism of Jaisalmer and the wild spirit of the area, along with the people will keep you at the edge of the seat at all times. Jaisalmer falls in the desert covered parts of the Indian state of Rajasthan. Though Jaipur is the capital city of the state, Jaisalmer has its fair share of admirers and that too, for good reasons. The city is situated at a distance of 575 kilometers towards the west of Jaipur. Due to the history, rich cultural heritage and presence of famous monuments, the entire city has been awarded the honor of being one of World Heritage Sites. The city rests on the sandstone ridges, which have a characteristic yellowish hue. According to survey reports, the city is inhabited by some 78,000 folks. The city also happens to be the administrative center of the Jaisalmer District. History tells us that the name of the city comes from the famous Maharawal Jaisal Singh. He was the main man behind the foundation of the city that happened in 1156 AD. The meaning of the name is “the Hill Fort of Jaisal.” The city is also termed as “Golden City” of the nation due to the abundant presence of yellow sandstones and yellow sand, which is the signature aspect of Rajasthan. The district of Jaisalmer is the biggest district of the desert state. There are no extra points for guessing that the city has an arid climate. This type of climate is characterized by very low precipitation and a huge range of highest and lowest temperatures. The city is set in the middle of the desert, and so, it has high daytime temperatures of 49 °C while the night time head drops to 25 °C during the summer months. During the winters, the highest temperature of the day remains close to 23.6 °C, but at night, the temperatures drop to 5 °C. The precipitation rarely crosses 209.5 millimeters on the rain gauge. The total area of Jaisalmer measures up to 5.1 sq. km. The actual elevation of the city is 225 meters above the mean sea level. The local people speak Rajasthani and Hindi. Most of the people are associated with farming and handicraft industry. Being in the heart of the arid desert, there is not much that the people expect from the farming aspects. There are no sources of perennial water source, and so, the farmers have to depend on artificial irrigation for growing crops. A major part of the area’s revenue is generated from tourism activities. Both national, as well as international tourists, flock to the district, and this adds to the revenue generated. As the foundation of the city and the district of Jaisalmer was done by the hands of a Rajput ruler, there are many forts and palaces, which have been attracting the eyes of the tourists. The specimens of Rajput architecture are recognized all over the world. The extravagance of the designs must be seen to be believed. Among the top forts, the main is the Jaisalmer Fort. It is popularly known as the “Golden Fort.” The fort was constructed under the supervision of Raja Jaisal. The fort was erected in 1156 AD. The construction of the fort was done with the locally found yellowish red sandstones, and the fort takes on a majestic appearance under the afternoon sun. The fort rises like an amazing mirage, among the wide spread sand dunes. There are 99 turrets on the fort, and with proper lighting, the fort looks like a grand giant, standing amidst the open sands. The fort has also got recognition internationally as it is seen as one of the biggest forts ever made. The Bada Bagh was a monument that as erected under the orders of Maharawal Jait Singh during the beginning of the 6th century. The construction could not be complete in his lifetime, and so the rest of the task was taken up by his son, Maharana Lunakaran. The meaning of the name Bada Bagh means the “huge garden” and its main purpose was to the site for cremating the members of the royal family and the nobles serving the kings’ court. The place has a haunting silence yet the peaceful calmness is unavoidable. Visiting the place during the sunrises and sunsets is highly recommended. It might seem surprising to some that the Rajputs used to give so much importance to the activities associated to cremation. According to the holy books of the Hindus, proper cremation would help the soul in traveling to the afterlife. Apart from the Rajput royals, the area was known for housing the communities of wealthy traders and bankers of the bygone era. The complex has a total of five mansions. The founding stoners were laid down by the affluent merchant and banker of the times named Guman Chand Patwa. Though he was unable to complete the constructions, the complex was finished by his successors. A lot of stress was given to highlighting the details on the walls and inner corridors. The architectural style of the mansions is breath taking, and you must applaud the intricate handiwork of the then craftsmen. Another important aspect of the haveli is that they have been made of the special yellow sandstones. Thus, the mansions look like they have been made of gold when the rays of the sun strike the walls. Most of the national and international tourists make it a point to book a seat in the Desert Safari. Reading about the ride on the back of the camels is one thing and experiencing the read deal is something different. Thus, more and more tourists are opting for the Sam Sand Dunes trip. If you are not comfortable with the camel rides, you can book a jeep to take you across the dry and sandy desert terrain. Move up along the crests of the dune and slide down when you come across the troughs. Even the adults seem to lose all inhibitions and enjoy a gala time here. During the months of February-March, the deserts come to life with the desert festivals. Watching the sun come out or set among the sand dunes will evoke the romantic sense in every person. The best thing about the government of the nation is that they have given due stress on highlighting the past of the region. What better way to shed light on the past than by erecting a fully operational museum. The Thar Heritage Museum is one such endeavor of the central and state governments. The museum is situated very close to the principal market. The museum is the brain child of Laxmi Narayan Khatri. You will be able to gather knowledge about the heritage, history, art and culture of the desert area. Currently, the maintenance of the museum is the responsibility of the state government of the area. There are some exhibits, which are millions of years old and it is surprising to know that they were found in the very region. The present sand covered terrain was once a huge water body. Models, highlighting the tectonic events and other associated geomorphic activities, which led to the formation of the desert, will enthrall both children and adults. Along with these, ancient scripts, coins, ornaments of the kings and gear they used for decorating camels and horses are also kept on display. Though the Jaisalmer area is predominantly arid and dry, there are some lakes, which add an extra beauty to the already enchanting city. Most of these lakes were constructed by the Rajput kings. It was done to save the people from the adverse effects of droughts, which is a common phenomenon of all desert areas. Keeping true to this tradition, the very first king of the desert land, Raja Rawal Jaisal was the man behind the erection of the Gadisar Lake. When the lake got subjected to damage, it was renovated and reconstructed in 1367 A.D under the orders of Maharawal Garsi. You will be able to book a boat ride and explore the entire lake in a royal manner. The boat rides will assist you in imbibing the calm and pious ambiance of the lake. The rural folks of the area depend entirely on the water of this manmade tank. The presence of many temples, holy shrines, and numerous Chattris, on both the banks of this lake, gives it an added charm. Red and yellow sandstones were used for making the tank. The carvings on the gate will take your breath away. Though the desert is a hostile environment, but Mother Nature has designed both flora and fauna, which will be able to survive in the harsh climate. These plants and animals not only add to the biodiversity of the area but all enhance the natural beauty of the terrain. If you happen to be an animal lover then visiting the Desert Nation Park is a must. It is a protected area and serves as a heaven for different kinds of animals. Booking a jeep for the desert park safari is a common practice for the tourists. During the winter months, you will be able to see various kinds of nomadic birds as well. These birds cross oceans and land here for evading the harsh winters in their native lands. There are no extra points for guessing that the local artisans of the area are very skilled in making handmade products. They make various kinds of ornaments made of silver and stones. Beaded ornaments are also popular among the tourists. If you love shopping for these products, then a trip to the Silk Route Art Gallery will prove to be fruitful. The quality of these objects is very good, and they will not only make you look good but will also add a charm to your personality. Roaming the halls of this gallery will give you the opportunity to see various kinds of garments, antiques, crockery, showpieces for decorating the homes and so on. Here, you will also get handmade paintings, done by the local painters. In this way, you will be able to take a piece of the culture and heritage of Jaisalmer with you. The cost of these objects is reasonable as the main purpose is not to acquire a big revenue but to speared a word about the handicraft of the area to the outer world. Apart from the forts of the Rajput kings, the house of their trusted courtiers, commonly known as the havelies, also interest the tourists. These courtiers were very wealthy, and they made extraordinary mansions for their use. With time, these mansions became tourist spots. One such haveli is the Salim Singh ki Haveli. As the name suggest, this was the house of Salim Singh. The mansion dates back to almost 300 years, and during that time, Salim Singh was the prime minister of the entire area. The house is also made of reddish sandstones. The detailed work on the walls and the windows are a sight to behold. When you walk among the inner corridors of the haveli, you will be able to feel the extravagance and rich taste of the people who lived here in the ancient times. The ceiling and walls of the haveli are richly decorated with paintings and frescos. The utensils used by the people are also kept on display. Just like the Sam Dunes, tourists seldom opt for the trip to the Khuri Dunes. This spot is located at a distance of around 40 kilometers from the man city. Most tourists are not aware of the presence of the place. For the lucky few who know, the place gifts them with an amazing tranquility and solitude. It is the best place to sit by yourself and admire the beauty of the arid lands. The area is dotted with some villages where you will be able to enjoy the company and delicious cuisines of the rural parts of the city. Taking a camel back ride is the idea way of exploring the vast emptiness of the dunes. People who are visiting the city during the months of February or March are in for a special surprise. They will get the chance to see the colorful and amazing desert festivals. The locals have the tendency to involve the tourists in the traditional song and dance performances. The international travelers seem to enjoy this to the hilt. The festivals are a celebration of the rich culture, art, heritage and lifestyle of the arid areas. There are performers who show you tricks with fire and the snake charmers, showing off their serpent handling skills. Another interesting part of the festival is the organization of various competitions. The most popular among these are the camel races, turban wrapping competition, mustache competition, where the person with the longest mustache is rewarded. Apart from these, camel back polo is a popular sport. Camel owners also take part in the camel adorning race. The desert pops with colors during the days of the festival. The entire state of Rajasthan is predominantly a Hindu state and so, all the Hindu festivals are celebrated here with a lot of enthusiasm. Among these, the Gangaur Festival is very important one for women. This particular festival lasts for a total of 18 days. The married women worship Lord Shiva and Goddess Parvati for the long life of their husbands while the young girls take part in the festival for getting a good life partner. The ladies get all decked up and flaunt colorful garments. They also decorate the statues of the Gods and Goddesses before worshiping them. At the end of the 18 day period, the idols are submerged in holy water of the rivers and lakes. Among the popular forts, you will come across the legends of some haunted forts as well. One such fort is the Khaba Fort. Around 200 years earlier, this area was the home of Paliwal Brahmins community. No one knows why they suddenly deserted the area and left. Due to lack of restoration, the fort has been falling off. Yet you will be able to make out the traces of carvings on the walls. You might get a spooky feel while in the area as these parts are not that popular among the tourists. Due to lack of human interference, the peacocks have made the place their roaming grounds. The Paliwal Brahmins were engaged in trading and farming but why they decided to leave behind their homes, still remains a mystery. Though most parts of Jaisalmer are covered with nothing but dry and dusty sands, there are some aspects that will attract the eyes of all geographers as well. It has already been established that what now is a barren land, once was a lush forest with a huge water body. Though it sounds unbelievable, a trip to the Akal Wood Fossil Park will clear things for you. The park is a natural miracle and has remains of flora, which have been found to be more than 180 million year old. All these were a part of a forest. The total area measures to be 21 hectare. Scientists are still working to unearth more of these specimens, which have been preserved so beautifully. These fossils will give scientist an idea about the geomorphological makeup of the area in the pre-historic times. Mammoth fossils of tree trunks and various kinds of crustacean shell fossils have been discovered here. The royal families of Rajput dynasties were predominantly the worshipers of the sun god and Lord Shiva. Most of the flags of the Rajput kings had the emblem of sun in the middle. The Surya Gate is dedicated to the sun god and it is a part of the Jaisalmer Fort. There are a total of four gates in the fort and the sun gate is the most elaborately carved and decorated of the other three gates. You have to pass through all these gates before coming onto the main compound of the fort. In keeping with the main theme of the fort, the sun gate is also made entirely of stone. The gate is comparatively narrow than the other entrance ways. You will not be able to resist the urge of clicking some pictures of yourself with the gate in the background. As the district of Jaisalmer is near the international border of India and Pakistan, some of the tourist attractions are in dicey territory. If you are traveling by road, it will take only about two hours for getting to the destination. The sanctuary has a fascinating history as it is trusted that amid the raging Indo-Pakistan War during 1965, Pakistani Army launched many shells at the sanctuary however none of them met the objective and a hefty portion of the bombs went for the encompassing locale of the sanctuary did not detonate. The sanctuary now has a historical center that shows accumulations of the unexploded bombs that were dropped by Pakistan. If you want to walk past the temple towards the border then you, will require special documents and permit from the authority. India is the land of many epics and according to these epics; the writers were actual persons and lived on the very lands. It is clear from the very name of this monument that it was erected to honor Rishi Vyas. The chhatri is one of the exquisite examples of the ancient Rajputana architecture. The fine detailing on the walls and the dome will urge you to click some pictures. The ambience of the area is also very appealing. If you are interested in knowing more about the religious beliefs of the local folks of Rajasthan and of Jaisalmer in particular then you, must visit the shrine, erected to celebrate and worship Ramdevji, a local folk deity of the area. The shrine is situated in the calm area of Ramdevra. He was a member of the Rajput community and raged a war all his life for the development and progress of all fraught classes. The rural people of the area are devoted to him. Legend has it that the shire was built during 1931, under the supervision of the then ruler of Bikaner, Maharaja Ganga Singh. It is said that the hero was rested in the nearby areas. The area is also called the Samadhi Mandir as the tombs of five popular Muslim Pirs were also constructed in the surrounding areas. The Shantinath Shrine is calculated among the seven famous Jain sanctuaries situated inside the Jaisalmer Fort. This 16th century sanctuary is erected to honor the Jain thirtankar, Shri Shantinath. Established in 1536 AD, the sanctuary shows a flawlessly created picture of the Jain holy person. Apart from the picture perfect setting of the holy shrine, the temple is a fine specimen of ancient architecture that reached the heights at that time. This construction is dedicated to the Muslim religion. The term Tazia refers to a special type of float. These floats are made during the month of Muharram. The building had been given the shape of this float by the architects. The designing and planning of the decoration scream of the basic patterns of Islamic theme. The building was constructed for the purpose of gifting. Apart from the places mentioned above, the area of Jaisalmer has much more to offer to the tourists. The tourists will get the chance to taste the delicious and lip-smacking cuisines of the area. Every night, the folk song and dance performers hold shows, which are aimed at entertaining the tourists. The central and state governments are taking required steps to make the place more popular among the international tourists.